Zen Micro Photo almost there! 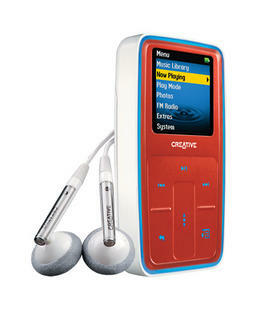 Creative's most popular MP3 player the Zen Micro will get a new version: The Zen Micro Photo. You will be able to find him in stores September or October with 8GB HDD for about $ 250. He will have a 262,144-color organic LED display and the battery life is 15 hours instead of the 12 hours from the original Zen Micro. Now you will also be able to chose the backlight color, which is blue on the Zen Micro. A bluetooth headphone set is amazingly versatile. It can be used not just for listening to your favorite music downloads, but also for a telephone receiver for your pda. While bluetooth technology often costs a bit more than those cable type of headphones, it is worth it to be free and to not have to worry about wire shorts that can interfere with the quality of your communication or music. If you do decide to buy bluetooth headphones for your pda, make sure they are compatible with your pocket pc. It makes no sense to spend that money to only find out that you have purchased something that is not going to work with your ipaq or palm pilot. Also, it is a good idea to read various reviews of a product, so that you know you are getting something that works well, as opposed to something that is simply expensive. The absolute freedom that comes with buying bluetooth headphones for your pda cannot be measured. Your pocket pc is an obvious extension of you, so why not make it as smart looking and efficient as you are? This is my second blog. After SoftwareFlash, here is now Gadget Flash!